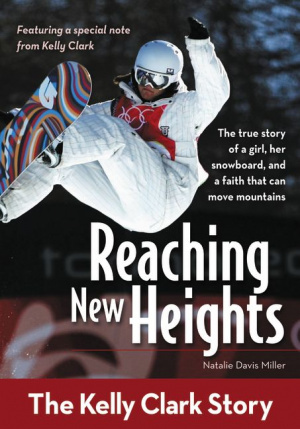 The true story of a young athlete, her snowboard and a faith that can move mountains - and it's a gripping read. This well-written book will be especailly appreciated by young and aspiring athletes - snowboarder or non-snowboarder, and by anyone on the brink of decisions of taking life and faith up to the next level, as Kelly Clark discovered that fateful, life changing day. At the youthful age of 16, Kelly Clark snatched 2nd place at the US Open. Kelly went on to scoop a mind-blowing 23 podium places before she was even a legal adult — including a Vans Triple Crown Win, a Junior World Championship Title, and an overall Grand Prix Title. Since then, she’s added multiple X Games Medals, a record-setting five US Open Pipe Wins, and Olympic Gold and Bronze. She has become the Queen of Snow. She attributes her successful career to the fact she has an awesome relationship with Jesus. Reaching New Heights tells the true story of how a 20 year old Kelly overheard a conversation on the snowboarding circuit that ultimately changed her life. Reaching New Heights by Natalie Davis Miller was published by Zondervan in October 2012 and is our 16024th best seller. The ISBN for Reaching New Heights is 9780310725428. Be the first to review Reaching New Heights! Got a question? No problem! Just click here to ask us about Reaching New Heights. Snowboarder and Olympic Gold Medalist Kelly Clark had accomplished her lifes goals by the age of 18. Yet, success didnt leave her feeling fulfilled. Two years later, at an event in Salt Lake City, Kelly stood at the bottom of the pipe, listening to one snowboarder console another who had just crashed: Its alright. God still loves you. These words led Kelly on a new journey from an Olympian snowboarder into an awesome relationship with Jesus. This story of one of the worlds greatest snowboarders will encourage readers young and old to reach for the next level, knowing that God will be with them, win or lose. ‘Reaching New Heights’ is a testimony to the fact that success in the world’s eyes is not enough. In fact it can be a distraction from that which truly fulfils and satisfies. Olympic champion and world-class athlete, snowboarder Kelly Clark, describes the excitement and her sport, and the thrill of finding her true identity in the love of God. ‘Reaching New Heights’ is an encouragement to excellence in life and in faith. In an uncertain world of flawed role models, broken heroes and limited opportunities, young people are searching for a place to focus their hopes, dreams and ambitions. The press and media are quick to attack any success achieved in politics, industry, commerce and practically any position of leadership – especially based in expressions of faith. Just about the only aspiration that a young person might dare admit to these days is in the world of sport. This is unfortunate, of course. The world still needs conscientious, talented and dedicated young people in every area of life, but you can’t blame them or wanting to be acknowledged for their commitment and success. It’s essential, then, that those with responsibility for young people set before them role models not only of success in their chosen discipline, but also successful people in the discipleship of Christ. How ever good a sports man or woman maybe, the honours will ultimately fade and they will be thrown back on themselves and the things that will last; the things of faith. Many sportsmen and women describe how easy it is to forget who you are in the demanding pursuit of sporting excellence. It’s all too easy to attach your identity and your self worth to your achievement, and look to others for acclamation, praise and the endorsement of who you are. It was the realisation that sporting success was the world’s measure of her worth, but not the only one – not even the most important one, that changed the life of top competitive snowboarder, Kelly Clark. That chance and indirect encounter gave her a whole new perspective on what it meant to be truly loved and appreciated for who she was – not for what she had done. Suddenly all her striving for a top place on the podium of her sport and in the esteem of her rivals counted for a lot less than she’d previously thought. Kelly’s story in not one of giving it all up FOR Jesus. It is a story of giving herself up TO Jesus. It’s about a change of focus that didn’t reduce her standing as a snowboarder, it increased the realisation of her own standing in the eyes of a God that loved her. A God that would continue to love her and fulfil her in a way that the world could not. This is what makes ‘Reaching For The Heights’ an important book for young and aspiring athletes. This is the biography of successful snowboarder Kelly Clark, written by Natalie Davis Miller. Miller, who has also written the story of American swimmer Cullen Jones, here charts the life of Kelly Clark - her rises and falls, wins, losses, and her discovery of faith. At 128 pages, this biography is succinct but thrilling. The story of Kelly Clark’s dreams to become a snowboarder, her success at the 2002 Winter Olympics and the subsequent period of depression she experienced before finding her identity in Christ make for a thrilling read. Also included in the book is a special note Kelly herself. Still aged only 29, her 12 year long snowboarding career continues. Already though, she has founded the Kelly Clark Foundation, which seeks to give opportunities to budding snowboarders. Natalie Davis Miller has been a professional writer for more than twelve years, writing a variety of stories for print and web, including articles on many sports figures such as football legend and movie icon Daniel 'Rudy' Ruettiger and the upcoming Zonderkidz biography, The Cullen Jones Story. Miller connects with her subjects and tells their stories in an informative and inspiring way, with a personal goal to glorify God using her writing talents.